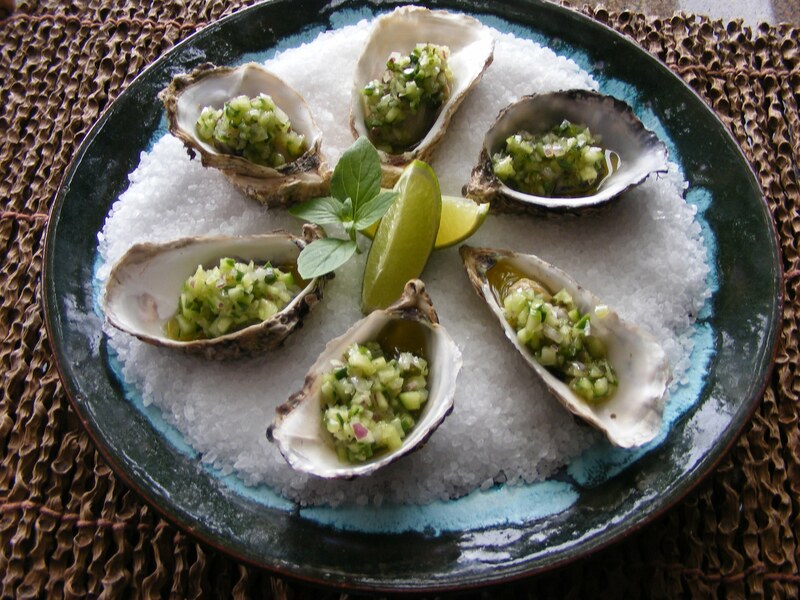 These Oysters with Cucumber and Mint Vinaigrette recipe is simple to prepare and absolutely delicious to eat. I discovered this fabulous dish when visiting Ponta Dos Gonchos, located on a tiny island off Brazil called Florianopolis. Talented Chef Luis Salvajoli served the most wonderful seafood throughout our stay, with a flair for combining unique, always fresh ingredients. Cook the oysters in a pan with just a little water. Cook until the shell opens. After the oysters are cooked, put then in a bowl with water and ice. Dice the cucumber with peel and red onion into small cubes. Slice mint leaves into thin strips. Mix the cucumber with olive oil and mint. Serve the oysters cold with the cucumber vinaigrette on top.